News that you may be interested in from Rochester to the rest of the world. We want to keep you up to date with the latest changes in healthcare and wellness services and policies. The IRS announced that the maximum FSA contribution limit for 2019 will increase by $50, from $2,650 to $2,700. The FSA limit increase is effective for FSA plan years beginning on or after January 1, 2019. The limit is based on the employee and not the household. If an employee and spouse both have access to their own FSA through their own respective employers, they are each eligible to contribute up to the $2,700 maximum into their respective FSA. In October 2018, the 2019 New York Paid Family Leave (PFL) employee contribution rates and updated annual cap were announced. As of January 1, 2019, the following will take effect. Premiums should be withheld from employees’ gross wages, until the annual cap is reached, which may occur prior to the end of the calendar year. As a reminder, new parents, family members caring for sick relatives, and employees with family members deployed abroad on active military duty, became eligible for Paid Family Leave benefits starting January 1, 2018. Clients enjoyed a morning of wellness on May 24th with Keynote Speaker Lisa Norsen, Chief Wellness Officer, UR Medicine Employee Wellness, followed by a Mindful Movement Activity with Marla Pellitier, Inward Office. 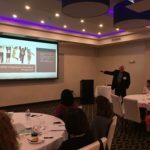 Smola Consulting Clients, Seneca Falls CSD and Goodwill of the Finger Lakes also shared some “Proof Positive” wellness success from their organizations. 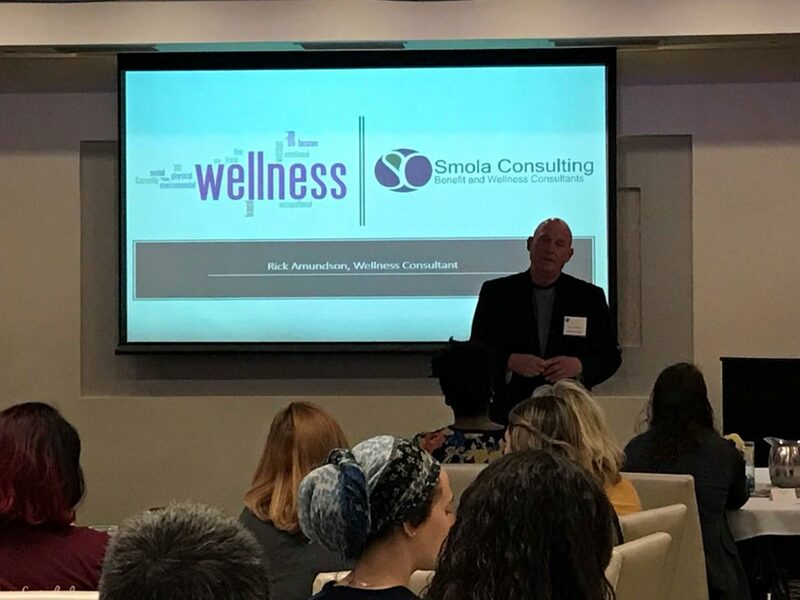 Rick Amundson, Smola Consulting Wellness Consultant also shared how he can support clients with their wellness initiatives. Smola Consulting’s next client wellness event is scheduled for September 27th. The IRS released the 2019 Health Savings Account (HSA) contribution limits, the minimum required HDHP deductibles, and the out-of-pocket maximums. Each year, the IRS reviews these figures based on a cost-of-living adjustment. The figures below pertain to HSAs and HSA-qualified High Deductible Health Plans. In May 2017, the IRS originally released the 2018 Health Savings Account (HSA) contribution limits, the minimum required HDHP deductibles, and the out-of-pocket maximums (https://www.irs.gov/pub/irs-drop/rp-17-37.pdf). However, the December 2017 passing of the Tax Reform Bill led to a review of the limits. Each year, the IRS reviews these figures based on a cost-of-living adjustment. The only change from the initial release was that the family HSA maximum contribution was adjusted downward to $6,850, compared to the previously announced limit of $6,900. On April 26, 2018, the IRS announced through the Revenue Procedure 2018-27 that the $6,900 family HSA maximum contribution will remain in effect for 2018, hence undoing the change of lowering this to $6,850. The figures below pertain to HSA and HSA-qualified High Deductible Health Plans. Smola Consulting Teams Up Again in 2018 to Support the Lollypop Farm Tails of Hope Telethon – March 2018. The Tails of Hope Telethon is the annual fundraiser that helps to fund the many great programs for pets in need. Smola Consulting supports this important annual fundraiser so that Lollypop Farm can provide food, shelter, veterinary services, and other forms of compassionate care for hundreds of pets every day. We are committed to providing support so that the many wonderful programs can continue to benefit the people and pets in our community. 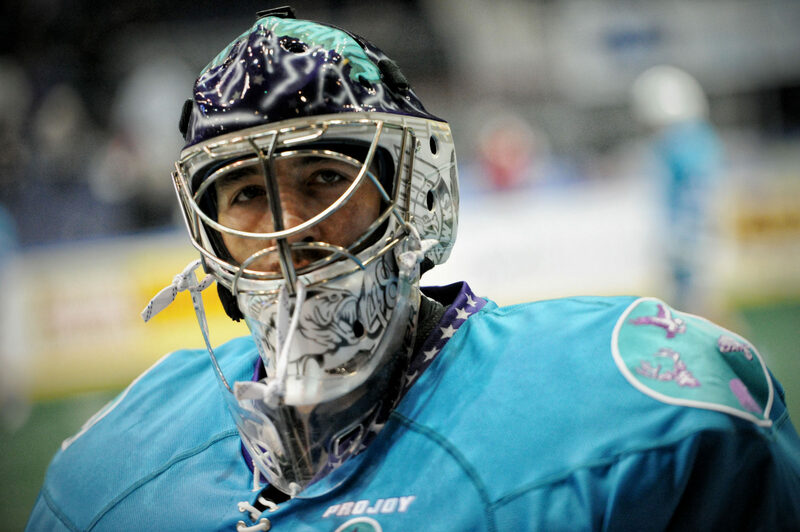 Smola Consulting is proud to partner with the Rochester Knighthawks to benefit one of Rochester’s great community assets, The Association for the Blind and Visually Impaired , an affiliate of Goodwill of the Finger Lakes.. Smola Consulting is donating $3 for each save the Knighthawks make during the 2018-2018 season. Smola Consulting is delighted to have the opportunity to contribute to the continued success of one of our clients. Steve Smola honored as 2017 Outstanding Small Business Philanthropist – Doing good things for the right reasons! Steve was honored and humbled to receive this award as his work with the Mary Cariola Children’s Center is a joy and rewarding in and of itself. Thank you to our extraordinary client and its leader, Karen Zandi for this nomination. In May 2017, the IRS originally released the 2018 Health Savings Account (HSA) contribution limits, the minimum required HDHP deductibles, and the out-of-pocket maximums (https://www.irs.gov/pub/irs-drop/rp-17-37.pdf). However, the December 2017 passing of the Tax Reform Bill led to a review of the limits. Each year, the IRS reviews these figures based on a cost-of-living adjustment. The only change from the initial release is that the family HSA maximum contribution is being adjusted downward to $6,850, compared to the previously announced limit of $6,900. This change may affect current and future contributions to HSAs. If an HSA participant has already contributed more than the family HSA maximum contribution of $6,850 for 2018, contact your HSA financial institution to initiate an excess contribution removal of the overage. On January 23, 2018, Congress passed, and President Trump signed into law, a stopgap spending deal that ended the shutdown of the federal government. The Cadillac Tax was delayed for two additional years, from 2020 until 2022. This tax would have imposed a 40% surcharge on employer sponsored health plans with premiums of more than $10,200 per year for individuals and $27,500 per year for families (these premium levels are estimates). The Cadillac Tax was previously delayed from 2018 to 2020. The Health Insurer Tax (HIT), which was included in all fully insured health insurance premiums, is projected to collect more than $14 billion in revenue in 2018. It is suspended in 2019. It will continue in 2018, and again in 2020. The 2.3% Medical Device Tax which imposed an excise tax on the sale of certain medical devices was delayed for two years, and will now begin in January 2020. The Congressional Budget Office estimated that $3.27 billion would have collected from device makers in 2018 and in 2019 if the tax were in effect. The Congressional Joint Committee on Taxation projected that suspension of these three taxes will add $31.25 billion to the federal budget deficit over the next several years.In addition to suspending these three Obamacare taxes as part of its deal to end the shutdown, Congress authorized funding of the Children’s Health Insurance Program (CHIP), which provides health coverage to about 9 million children, for six more years. In an effort to prevent fraud, fight identity theft, and keep taxpayer dollars safe, Centers for Medicare & Medicaid Services (CMS) is removing Social Security Numbers (SSN) from Medicare cards in a year-long phased approach, beginning April 2018. The Medicare Access and CHIP Reauthorization Act (MACRA) of 2015 requires the removal of Social Security Numbers (SSN) from all Medicare cards by April 2019. A new Medicare Beneficiary Identifier (MBI) will replace the SSN-based Health Insurance Claim Number (HICN) on the new Medicare cards for Medicare transactions like billing, eligibility status, and claim status. Between April 2018 and April 2019, CMS will mail the new Medicare cards to all people with Medicare in phases by geographic location. People with Medicare will receive a new Medicare card in the mail, and will be instructed to safely and securely destroy their current Medicare card and keep their new Medicare number confidential. Issuance of the new number will not change benefits that people with Medicare receive. Medicare members will receive their new card automatically in the mail to their address on file with CMS. Addresses can be updated by Medicare members contacting Social Security at ssa.gov/myaccount or 1-800-772-1213. Please see the attachment for information from CMS about how the new Medicare cards will look, and what details will be included in the mailing to Medicare members. Note that Medicare will never call asking for personal information. Beware of anyone who contacts a Medicare member asking about personal information, or about their new Medicare card. The IRS has announced that the maximum FSA contribution limit for 2018 will increase by $50 – from $2,600 to $2,650. The FSA limit increase is effective for FSA plan years beginning on or after January 1, 2018. The limit is based on the employee and not the household. If an employee and spouse both have access to their own FSA through their own respective employers, they are each eligible to contribute up to the $2,650 maximum into their respective FSA. This is a follow-up from the Smola Consulting Benefits Bulletin posted on 7/21/2017 regarding New York Paid Family Leave (PFL) benefits starting January 1, 2018 for new parents, family members caring for sick relatives, and employees with family members deployed abroad on active military duty. As referenced in the Notice, it is the responsibility of each employee and employer to consult with a tax advisor. On Wednesday July 19, 2017, the New York State Workers Compensation Board posted Final Regulations regarding New York Paid Family Leave (PFL), which takes effect on January 1, 2018. Governor Andrew Cuomo announced that the state has adopted regulations implementing New York’s Paid Family Leave program. These regulations outline the responsibilities of employers and insurance carriers in implementing the most comprehensive paid family leave program in the nation. New parents, family members caring for sick relatives, and employees with family members deployed abroad on active military duty, are eligible for Paid Family Leave benefits starting January 1, 2018. The IRS released the 2018 Health Savings Account (HSA) contribution limits, the minimum required HDHP deductibles, and the out-of-pocket maximums. Each year, the IRS reviews these figures based on a cost-of-living adjustment. The figures below pertain to HSA’s and HSA-qualified High Deductible Health Plans. All High Deductible Health Plans that have a $1,300 / $2,600 deductible for 2017 must increase that deductible to at least $1,350 / $2,700 upon their renewal for 2018. The IRS has announced that the maximum FSA contribution limit for 2017 will increase by $50 – from $2,550 to $2,600. This is the first increase to the limit in two years, and only the second increase since the limit was originally set at $2,500. The FSA limit increase is effective for FSA plan years beginning on or after January 1, 2017. The limit is based on the employee and not the household. If an employee and spouse both have access to their own FSA through their own respective employers, they are each eligible to contribute up to the $2,600 maximum into their respective FSA. The annual baseline budget projections by the Congressional Budget Office and Joint Committee on Taxation (CBO), is projecting employer responsibility penalties to total $228 billion by the end of 2020. The individual mandate penalty will yield a projected $28 billion. The high-premium employer plan’s Cadillac Tax is expected to yield $18 billion. These penalty estimates have tripled over the last year. Employers should know that The Department of Labor is expecting to audit every employer with over 50 employees by the end of 2018. Employers can expect IRS penalty notification and collections to increase after the election. Recently, The Department of Labor published an interim final rule to adjust for inflation within the civil monetary penalties enforced by the Department of Labor. This Benefits Bulletin describes some of the adjustments made to the benefit-related civil monetary penalties enforced by the Employee Benefits Security Administration (EBSA) under the Employee Retirement Income Security Act of 1974 (ERISA). As penalties have not kept up with the rate of inflation, Congress enacted legislation requiring an initial “catch-up” adjustment to specified penalties, followed by annual adjustments. The rule’s catch-up adjustments apply to penalties assessed after August 1, 2016, whose associated violations occurred after November 2, 2015. Beginning in 2017, the Department of Labor will adjust the new ERISA Title I penalty amounts annually for inflation by January 15. For example, by January 15, 2017, the Department will adjust annual penalty amounts to reflect any increase in inflation from October 2015. Form 5500: The maximum penalty for failing to file Form 5500 (due the last day of the seventh month after the plan year ends) will increase from $1,100 to $2,063 per day that the Form 5500 is late. Group Health Plans: Failure to provide the Summary of Benefits and Coverage (SBC) will increase from $1,000 to $1,087 per failure. Maximum penalties relating to disclosures regarding the availability of Medicaid or CHIP assistance, including failure to disclose to a state, on request, and relevant information about the employer’s plan, will increase from $100 to $110 per day. 401(k) Plans: For plans with automatic contribution arrangements, penalties for failure to provide the required ERISA pre-emption notice to participants will increase from $1,000 to $1,632 per day. Failure to furnish reports, such as pension benefits statements to certain former participants and beneficiaries or failure to maintain records, will increase from $11 to $28 per employee. On a related note, The Department of Labor released a proposal to improve and modernize Form 5500, where revisions, if approved, will begin with the Plan Year 2019 that will be filed in 2020 (https://www.dol.gov/newsroom/releases/ebsa/ebsa20160711). The IRS released the 2017 Health Savings Account contribution limits, the minimum required HDHP deductibles, and the out-of-pocket maximums. Each year, the IRS reviews these figures based on a cost-of-living adjustment. All High Deductible Health Plans and Health Savings Accounts with Smola Consulting Clients will be compliant with these 2017 IRS updates. On December 15, 2015, Congress approved a two-year delay of the Cadillac Tax. The “tax extender” package and provision was signed by the President, making it official. The Cadillac Tax effective date will move from 2018 to 2020. The delay was included in a year-end tax and spending package that also makes the Cadillac Tax tax-deductible for employers who pay it. The Cadillac Tax is a 40% excise tax originally scheduled to take effect in 2018 to reduce health care usage and costs by encouraging employers to offer plans that are cost-effective, and engage employees in sharing in the cost of care. It is a 40% tax on employers that provide high-cost health benefits to their employees. These thresholds (originally set for $10,200 for single coverage and $27,500 for family coverage in 2018) will be updated for 2020 when final regulations are issued, and then indexed for inflation in future years. For insured plans, the employer calculates the tax and the insurers pay. For self-funded plans, the employer calculates and pays the tax. As noted above, another change is that the Cadillac Tax will now be tax-deductible. Coverages exempt from the Cadillac Tax include insured or self-funded stand-alone dental plans, insured or self-funded stand-alone vision plans, accident only coverage, disability benefits, worker’s compensation, liability insurance, and long-term care insurance benefits. On 9/17/2015, the IRS issued final forms and instructions for employer reporting relating to insured health plan coverage. The forms will be used to enforce Affordable Care Act employer penalties and individual mandate and tax credit eligibility rules with mandatory reporting starting in 2016 for the tax year 2015. Large employers with 50 or more full-time employees (including full-time equivalents) are required to complete these forms. Form 1094-C is the Transmittal of Employer-Provided Health Insurance Offer and Coverage Information Returns. This form is used to report aggregate employer level data on each employee. Form 1094-C is used to provide summary information for each employer, and each employer will submit this form to the IRS. Form 1095-C is the Employer-Provided Health Insurance Offer and Coverage. Form 1095-C will be submitted to the IRS and will be provided to each employee as it includes information about the health insurance offered to them. This form must be filed for everyone who was a full-time employee of the employer for any month of the calendar year. These reports are due in January 2016 for coverage offered in calendar year 2015. There is no change to Form 1094-C (http://www.irs.gov/form1094c). Line 10. The telephone number to call with questions can also be used to report information errors on the form and ask that they be corrected. Line 14. Explanation that coverage reported does not include coverage offered through a multiemployer plan due to membership in a union. Line 14. Code 1A removed the dollar value to report coverage providing minimum value of self-only coverage, employee contributions equal to or less than 9.5% of the 48 contiguous states single federal poverty line versus equal or less than $1,108.65. Copies of Form 1095-B provided to individuals may include only the last four digits of Social Security Numbers (SSNs) or EINs. Forms filed with the IRS must include the complete numbers. SSNs may be left blank if the individual does not have a SSN. The instructions provide information about what to report for an individual who has more than one type of Minimum Essential Coverage. Beginning in 2017 (for 2016 coverage), insurers must report catastrophic health plan coverage sold through the Marketplace. Reporting this coverage is optional but encouraged in 2016. Clarification that insurers must identify employers that sponsor coverage through an association or MEWA but not multiemployer plan. If the VA hospital care or medical services are specifically affiliated to a service-connected disability, veterans are eligible to contribute to an HSA on a pre-tax basis. This new legalisation was amended on 7/31/2015 as part of the Surface Transportation and Veterans Health Care Choice Improvement Act of 2015. Prior to 2016, individuals were not eligible to make HSA contributions for any month that they receive VA medical benefits at any time during the previous three months. The legislation does not reference if anyone else beyond the eligible veteran (such as an employer) can contribute to that veteran’s HSA. Note that this excludes TRICARE, which is administered by the Department of Defense and not through the VA.
Below is an article released today from Washington (Associated Press), detailing the Supreme Court’s ruling to uphold the Affordable Care Act’s federal subsidies. The ruling holds that the Affordable Care Act authorized federal tax credits for eligible Americans living not only in states with their own exchanges, but also in the 34 states with federal marketplaces. WASHINGTON (AP) – The Supreme Court on Thursday upheld the nationwide tax subsidies under President Barack Obama’s health care overhaul, in a ruling that preserves health insurance for millions of Americans. Chief Justice John Roberts again voted with his liberal colleagues in support of the law. Roberts also was the key vote to uphold the law in 2012. Justice Anthony Kennedy, a dissenter in 2012, was part of the majority on Thursday. “Congress passed the Affordable Care Act to improve health insurance markets, not to destroy them,” Roberts wrote in the majority opinion. Of those receiving subsidies, 6.4 million people were at risk of losing that aid because they live in states that did not set up their own health insurance exchanges. The challenge devised by die-hard opponents of the law, often derided by critics as “Obamacare,” relied on four words – established by the state – in the more than 900-page law. In the challengers’ view, the phrase “established by the state” demonstrated that subsidies were to be available only to people in states that set up their own exchanges. Those words cannot refer to exchanges established by the Health and Human Services Department, which oversees healthcare.gov, the opponents argued. The 2012 case took place in the midst of Obama’s re-election campaign, when he touted the largest expansion of the social safety net since the advent of Medicare nearly a half-century earlier. But at the time, the benefits of the Affordable Care Act were mostly in the future. Many of its provisions had yet to take effect. The IRS released the 2016 Health Savings Account contribution limits, the minimum required HDHP deductibles, and the out-of-pocket maximums. Each year, the IRS reviews these figures based on a cost-of-living adjustment. All High Deductible Health Plans and Health Savings Accounts with Smola Consulting Clients will be compliant with these 2016 IRS updates. The IRS has issued final forms and instructions for employer reporting and notices relating to insured health plan coverage. The final versions are largely unchanged from the prior draft versions. The forms will be used to enforce Affordable Care Act employer penalties and individual mandate and tax credit eligibility rules with mandatory reporting starting in 2016 for the tax year 2015. Large employers with 50 or more full-time employees (including full-time equivalents) are required to complete these forms. Form 1094-C is the Transmittal of Employer-Provided Health Insurance Offer and Coverage Information Returns. This form is used to report aggregate employer level data on each employee. Form 1094-C is providing summary information for each employer, and each employer will submit this form to the IRS. Attached are the final version of Forms 1094-C and 1095-C. Both Finance Manager (FM) and WinCap are aware the IRS has provided final forms. Tim Keller at Genesee Valley/Wayne-Finger Lakes Educational Technology Service has let Smola Consulting know neither organization has released the modules that will support the completion of these forms. He is expecting them soon. You must file Forms 1094-C and 1095-C by February 28 if filing on paper or March 31 if filing electronically of the year following the calendar year to which the return relates. For calendar year 2015, Forms 1094-C and 1095-C are required to be filed by February 29, 2016, or March 31, 2016, if filing electronically. This information does not constitute legal advice. Employers should consult their own legal counsel with respect to compliance with these laws. As the realm of compliance and regulations continues to get more complex each year, Smola Consulting is featuring this Benefits Bulletin that summarizes the annual employee compliance notice requirements, and the acceptable distribution method of employee notification. The table below summarizes the five notices that must be made available to employees. Specific requirements exist for providing notices through electronic communications. Compliance with these requirements is critical. Conditions set forth below and in the Regulations for electronic disclosures must be satisfied. The individual who is the recipient of an electronic notice retains the right to obtain a paper copy of the notice from an employer upon request. Employers should always state on the electronic transmission that these documents are available in paper / written format, and can be requested through Human Resources. Individual employees covered by the plan who does not have access to employer intranet or e-mail must be provided the notice in paper format. Smola Consulting is proud to be the presenting sponsor at the Mary Cariola Children’s Center Annual Dinner on May 21. Smola Consulting participated in the 2015 Lollypop Farm Telethon – Tails of Hope – at Eastview Mall on March 7. Over $273,000 was raised to give a second chance to pets in need. The telethon was televised live on 13 WHAM ABC. 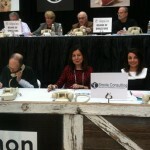 Smola Consulting staff manned the phone bank speaking with generous contributors. Smola Consulting donates over $15,000 annually to help save the lives of homeless and abused pets in our community. We proudly sponsor Lollypop Farm so they may provide veterinary intervention, food, shelter and compassionate care to pets in need. Steve Smola, Board of Directors Treasurer for IACKids, believes it really is all about the kids. Smola Consulting was a title sponsor for the 2015 Open Your Hearts Gala Dinner held on March 7. IACKids was founded in 2012 to help families in the greater Rochester region going through financial hardship due to their child’s severe illness. Pediatric Social Workers at the Golisano Children’s Hospital help identify families in need. The 2015 gala raised over $100,000. On 11/21/2014, federal regulators proposed that insured and self-funded employers would have to pay $27 for each health plan enrollee in the third and final year of the Transitional Reinsurance Program, authorized by the Patient Protection and Affordable Care Act (PPACA). Self-funded employers pay this fee separately, where insured employers have this fee built into their rate. The $27 fee, to be paid in 2017, has been proposed and is not final. It comes on top of an earlier disclosed $63-per-health-care-plan-participant fee that is to be paid next year, and a $44-per-participant fee that is to be paid in 2016. The fees, whose amounts were set by the U.S. Department of Health and Human Services, are intended to generate $25 billion in revenues over a three-year period as set by the Patient Protection and Affordable Care Act, including $12 billion in the first year, $8 billion in the second year, and $5 billion in the third year. The revenue generated by the program is to be used by the government to partially reimburse commercial insurers covering individuals with high health care costs. Earlier, regulators said the 2014 fee could be paid in full with one $63-per-participant payment made by 1/15/2015. Alternatively, rather than pay the full $63 by 1/15/2015, employers could make a payment of $52.50 per participant by that date, with an additional $10.50-per-participant payment due 11/15/ 2015. Employers and health care plan sponsors also can choose between paying the 2015 and 2016 fees with one payment or with two payments. The 2015 fee could be paid in full with one $44-per-participant payment made by 1/15/2016, or with a $33 payment made by that date, and an $11 payment made by 11/15/2016. Similarly, the $27-per-participant fee for 2016 could be paid in full by 1/15/2017, or with a $21.60 payment made by that date, and a $5.40 payment made by 11/15/2017. Smola Consulting was pleased to participate in 2014 Walking on Sunshine Event held at Ontario Beach Park on September 28 . The Smola Consulting team staffed the auction tent. 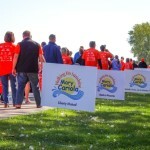 Over 1,400 people took part in the walk. Mary Cariola surpassed their goal of $135,000 by raising nearly $149,000! Smola Consulting is proud to support the youth that Mary Cariola serves. On February 10, 2014, the IRS and Treasury Department issued final regulations that impact enforcement of the Employer Mandate. Two changes were announced – one impacting employers with 50-99 employees, and the other with greater than 100 employees. Employers with 50-99 full-time workers workers will be given until 2016 to offer health insurance coverage to employees before they risk a federal penalty for not complying. Employers with 100 or more full-time employees will be subject to the mandate starting in 2015, although coverage to eligible full-time employees is reduced from 95% to 70% in 2015 to avoid the Type A penalty. Employers will need to offer coverage to at least 95% of eligible employees in 2016 to avoid the Type A penalty. Clarification was provided for employers with a plan year which doesn’t start on January 1. The mandate was previously unclear when the penalty would apply – on January 1, 2015 or on the first day of the plan year (if not January 1). For employers with 100 or more full-time employees, the mandate will apply on the first day of their plan year in 2015 (meaning employers with non-calendar year plans will not have to provide coverage to full-time employees on January 1, 2015; coverage must be provided as of the first day of the plan year starting in 2015). One additional clarification was provided regarding the length of the measurement period. In 2014, a shortened transition measurement period of six months is permitted. The full-time employee definition remains at 30 hours or more per week. The definition of dependent has been revised to exclude stepchildren and foster children, and continues to exclude spouses. The IRS issued Notice 2013-71 on October 31, 2013, which now allows up to $500 of unused funds in Flexible Spending Accounts to be carried over to the next plan year. This change can be effective to plan years beginning in 2013 and after, as long as you amend your plan document accordingly. On December 31st of this year, “use it or lose it” will only apply to dollars $501 and above. The rollover can be $500, or any lesser amount. Employers can set a lower rollover amount, but it must make that same rollover limit available to all eligible plan participants. This change is at the employer’s discretion. The FSA medical limits remain the same at $2,500. However, up to $3,000 may be available in the following plan year if the participant were to rollover the full $500 the prior year. An employer can only implement this new rollover option if the plan does not include a grace period. If a grace period currently exists, it must be removed before the new rollover option is implemented. This new amendment will require a plan document amendment. Amendments to remove the grace period, if applicable, and to adopt the rollover provision, must be adopted on or before the last day of the plan year from which amounts may be rolled over. The Finger Lakes Area School Health Plan school consortium – comprised of 37 school districts in Livingston, Ontario, Wayne, Seneca and Yates counties – was recognized as a leader in promoting worksite wellness within their school districts. The FLASHP consortium has an active wellness committee – Wellness is Now (WIN) – has done a fantastic job promoting health and wellness throughout the consortium. WIN has developed ways health and wellness can be incorporated into the daily lives of employees. They provide resources, education and programs to benefit employee health. Their hard work and dedication to wellness earned them the large employer 2013 Wealth of Health Award! The Department of Health and Human Services (HHS) issued final Patient Protection and Affordable Care Act (PPACA) Health Care Reform rules on May 29th, 2013 regarding employment based wellness programs. The final regulations increase the maximum permissible reward under a health-contingent wellness program offered in connection with a group health plan from 20% to 30% of the cost of coverage, and to 50% when the wellness program is designed to prevent or reduce tobacco usage. The final rules will be effective for plan years beginning on or after January 1, 2014. The final rules support workplace health promotion and prevention without regard to an employee’s current health status. These Health Care Reform rules expand non-discrimination protections for employer-sponsored wellness programs. The final rules also provide more clearly defined guidelines to design and implement workplace wellness programs than were in HHS’s initial proposal. The final rules include standards for both participatory wellness programs (those available without regard to an individual’s health status such as rewards to employees for taking a health risk assessment, or participating in a biometric screening, etc), and wellness programs that have “health contingent wellness programs” (those which reward individuals for meeting a specific health standard such as no tobacco usage, having a specified cholesterol level, etc). Avoiding a penalty, such as the absence of a surcharge or other financial or nonfinancial. Recommendations be accommodated which are made at any time by an individual’s physician based on medical appropriateness. On July 2, 2013, the Treasury Department announced a one year delay in the employer mandate which penalizes employers with more than 50 employees for not providing a minimum level of affordable health insurance. Originally the penalty was to be effective starting in 2014. However, these penalties have officially been delayed until 2015. This is designed to meet two goals. First, it will allow us to consider ways to simplify the new reporting requirements consistent with the law. Second, it will provide time to adapt health coverage and reporting systems while employers are moving toward making health coverage affordable and accessible for their employees. The individual mandate is unaffected by the rule change, requiring most Americans to purchase insurance or pay a penalty, with tax credits provided to those who can’t afford coverage. Also unaffected is the establishment of exchanges in states for low-income Americans to obtain health insurance. We will continue to keep you informed as more information becomes available. As a requirement of the Patient Protection and Affordable Care Act (PPACA), all employers with over $500,000 in annual revenue are required to notify all employees about their healthcare options available through the Health Insurance Exchanges. This Benefits Bulletin addresses the temporary guidance of this notification that was issued on May 8, 2013. Employers are not yet required to provide notices under this temporary guidance, and can wait until formal guidance is provided later this year. This notification is called the Employer Notice of Coverage Options, and a template is located at http://www.dol.gov/ebsa/pdf/FLSAwithplans.pdf. Originally scheduled for March 1, 2013, this notice deadline has been delayed until October 1, 2013 to coincide with the beginning of the Health Insurance Marketplace (Exchange) open enrollment period.